Preston & I have no specific plans for NYE. Picking up a bottle of champagne is still on the to-do list, and I just finished my nails for the occasion. They were supposed to be fireworks, but they kind of look more like a bowling alley's carpet. Oh well, I tried. I used Zoya Storm as a base, and Julie G Textured polish for an accent. 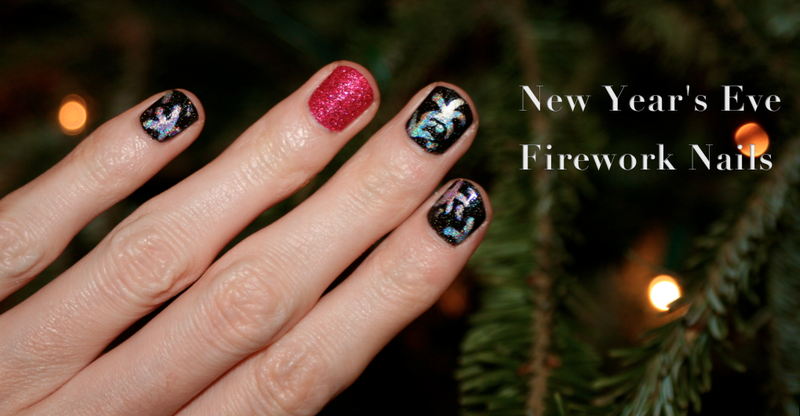 For the fireworks, I used a dotting tool and Urban Outfitter's Holo Polishes in Silver Holo, Pink Holo, and Green Holo. Maybe just doing dotted lines for the fireworks would be more realistic? At least the colour scheme is quite NYE. Last year's mani is shown here. I used Zoya Storm & the UO Silver Holo then too! I am looking forward to 2014! I can't believe it is here already, but I have a feeling it's going to be an amazing year. Wishing you a Happy New Year! And a fun New Year's Eve!